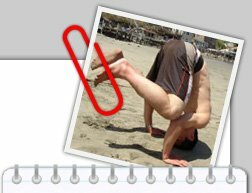 Vincent Cheung: The return of the blender! 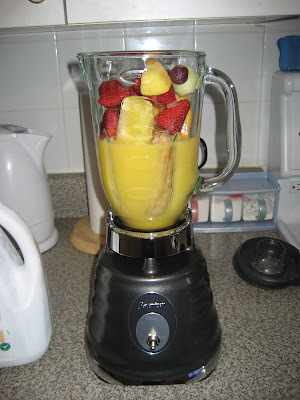 First blend: too much fruit and not enough juice. I add pineapple now and don't add ice. Sometimes I add a little bit of water to lighten it up. 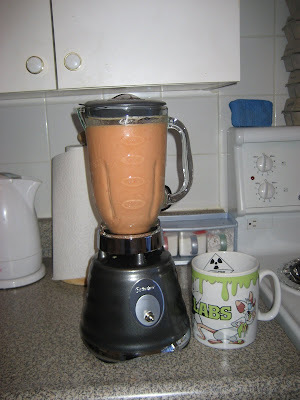 A little while ago, my blender broke. The knob that controls the speed snapped off a while back, but was still working, but then the plastic started warping and was stuck on "1". I used it once like that by plugging and unplugging it repeatedly, but I couldn't continue. I returned it to Loblaws, but they didn't have another blender in stock!!! I almost saw it coming and was thinking that with my luck, they wouldn't have one in stock. I thought about it for a bit wondering whether I should actually return it or keep it and use my plugging-unplugging technique and try to return it later. I decided to just return it (2 year warranty) and then try to get another blender later. 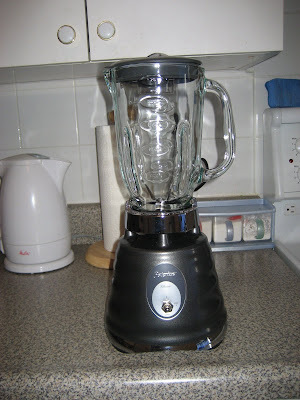 I wanted to get the same blender, but you can't buy it online and the Superstore locations which are supposed to regularly have them in stock are too far away. I bought it from Home Outfitters / HBC and it shipped really fast. I ordered it late Thursday and it arrived Monday morning. Fortunately, my suitemate answered the door. I'm a pretty sound sleeper and didn't even hear the knock. I woke up and found the blender on the floor :). It was shipped through Canada Post, so even if I didn't answer, I could have at least picked it up at the Shopper's down the street at the end of the day as opposed to the hassles with the crappy delivery companies. I'm still getting used to the blender, but I'm liking it. The big difference is that it makes smoother smoothies. It just blends more finely. This actually poses a problem for my "recipes" because with the usual amount of fruit and juice, it doesn't blend very well. The reason is because the fruit is pulverized more finely and then becomes icier (good thing), but it then requires more liquid for it to flow properly and I haven't quite gotten the right mix yet. Another nice thing is that the blender blends the seeds so there is less chewing at the bottom of the glass/mug. At the highest setting, the blender is very loud, vibrates on the counter a little, and blows out air quite viciously, but I have been finding that the lower setting is fine. The construction of the base, especially the switch, is stronger than the PC one, heavier as well. The glass container is slightly smaller, which isn't too much of a concern for a single serving for me (1 litre :)), but limits how much I can blend in the future. It's a good blender, but not 3 times better than the PC one. 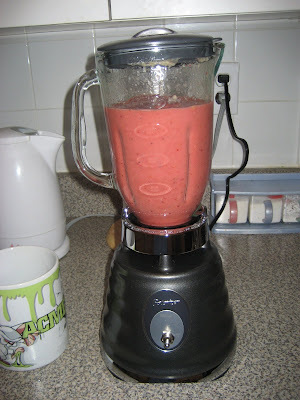 at the risk of sounding like a fool... how do you make a good smoothie? do you icecream or milk? how much ice? how do you keep the drink from getting tart. i like sweet but not tart. thanks. i've noticed i dont intake fruits at all. perhaps smoothies will help. I based my fruit smoothies on the bubble tea place, Bubble Tease, near my apartment and the fruit smoothies made at Google. My original blender post documented the process though I have since removed the ice step. I just throw in some frozen fruit (store bought frozen fruit) and add juice. A fresh banana adds a nice flavour. I often use frozen bananas because I can't finish the whole bunch of bananas before they go bad, so I just peel them and put them in a ziplock in the freezer. I don't add extra sugar as the fruit and juice are sweet enough, at least for my tastes. I keep it simple, pure, and healthy. At Google, plain yoghurt and various vitamin supplements and other stuff are optional. At Jamba Juice in the States, they use sherbet in their smoothies. Try various things and see what you like. oster beehive blender? 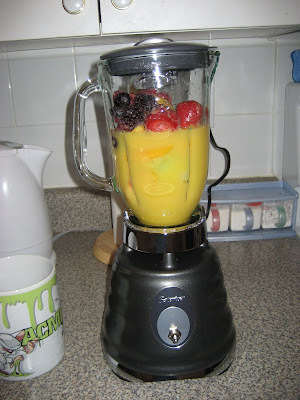 blah, leave the job to the Blendtec Total Blender!